With the introduction of PS Vita TV Sony have also announced a brand new Playstation Vita model titled "PS Vita PCH-2000"
The new model features ergonomic improvements such as the console being 20% lighter and over 15% thinner than the launch model. Most likely due to fan backlash the PS Vita features 1GB of onboard storage. Sony have also ditched the PS Vita's unique charging port with a standard Micro USB port. And an extra hour of battery life. "The new PS Vita system features an enhanced, rounded shape," the company says. "Coupled with the trimmed down body, users will be able to enjoy game play more comfortably. In addition, the PS button / START button / SELECT button have been modified to a round and convex shape, allowing users to push more easily." Though Sony have not changed the resolution of the PS Vita 2000's screen instead they have swapped the current OLED screen with a more standard LCD. Sony claims the new screen meets the standards of the launch model. The new model will be substantially cheaper than the launch model. The new model costs18,980 yen (US $190), This is a massive drop over the launch model which costs over $300. The model will be available in Japan October 10th. 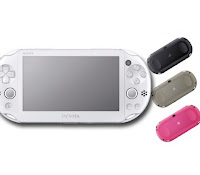 By looking at every feature its safe to say that the PS Vita 2000 does not make the launch model obsolete as there are not much new features and thanks to the OLED screen some may say the older model is still the better handheld. Let us know what you think of the PS Vita 2000 in the comments below!